Blood Dragon's lead voice actor says the sales of the game have exceeded five times initial expectations. 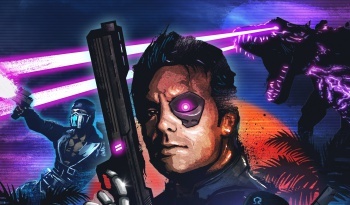 Far Cry 3: Blood Dragon is an amazing game that takes the best parts of the Far Cry 3 engine and covers them with a hearty layer of parody, cheesiness, and of course, neon. The game came out of no-where and has taken the gaming world by storm, with sales exceeding up to five times Ubisoft's initial sales expectations, according to lead voice actor Michael Biehn (Terminator, Aliens). The sales were so impressive, says Biehn, that creative director Dean Evans already has a sequel in mind. "Dean was with me on the phone last night. He was pretty jacked up. He was going into a meeting today, to you know... I think he wants to turn it into some sort of franchise. He's got a sequel in mind." Biehn, who was cautiously optimistic of the project when first approached by Evans, says he has experienced a lot of unexpected fame from the game. He was shocked to find that people would come up to him on the street to ask about Blood Dragon. He says that Evans was so enthusiastic about the project that he had a hard time turning him down. When asked if this could spark a career in videogame voice acting for the iconic action hero, Biehn said that he has promised exclusivity to Evans and the Blood Dragon franchise. If you are worried that any potential sequels might get stale, and overdo the "so stupid it's funny" parody writing, Biehn assures us that Evans has plenty of cool ideas for a potential sequel, such as the possibility of different timelines. Blood Dragon is exactly what I want to see more of. Developers taking their big, serious assets and using them to make fun little spin off side-projects. At $15 and lasting around 5 hours, it's a DLC that's actually worth buying, rather than the $5 costume packs/unlockable weapons other developers keep trying to sell us.